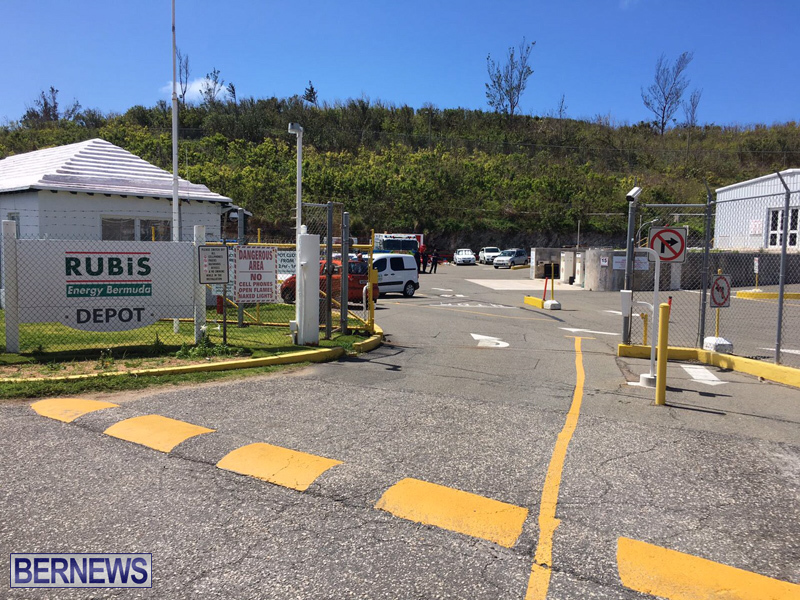 The Department of Environment and Natural Resources provided an update on the gasoline spill at the RUBiS facility in Ferry Reach in March. A Government spokesperson said, “The Department of Environment and Natural Resources [DENR] wishes to update the public on the gasoline spill that occurred at the RUBiS Energy Bermuda Ltd. facility, Ferry Reach on 27 March 2017. ‘Dissolved Plume’ of more water-soluble components in the gasoline that are dissolved in the groundwater. “The Interim Abatement strategy of recovering the liquid and vapour plumes has continued, using six purpose-designed vapour extraction recovery wells, plus a gasoline vacuum skimmer. “Operational data indicates that the vacuum extraction system is limiting the liquid and vapour plumes to the confines of the RUBiS site. Regular groundwater sampling is being performed to assess the potential for any constituents that comprise the ‘dissolved plume’ to migrate beyond the site boundaries at concentrations exceeding drinking water or odour-threshold limits. “The Soil Vacuum Extraction system has been operating daily since 1 April with occasional downtime for maintenance and upgrades. The recovered vapour/liquid product from this system is about 15% of the original volume of the spill as of 26 July. “This backs up previous predictions that active clean-up operations will likely run for several years, followed by a confirmatory monitoring period following active remediation. Bacteria, that are naturally present in the ground/groundwater, are expected to remove further gasoline through biodegradation over time. “In addition to the weekly updates and the Limited Site Assessment Report [LSAR] submitted in June 2017 RUBiS Energy Bermuda Ltd and their consultants Arcadis Ltd are currently preparing a Comprehensive Site Assessment report [CSA], following Government’s established guidelines. “This report will be reviewed by DENR personnel and Government’s consultant, Dr John Wilson, to ensure that the appropriate long-term remediation strategy is designed and implemented. How much fuel leaked out of the Rubis facility – the public deserve the facts!